The Jim Patchell/MMM Assembled/tested DIY board is now on sale until midnight PST Tuesday Feb 16, 2010. This filter was designed exclusively for MMM by our own synth DIY guru Jim Patchell. He did a great job! As many of you know, Jim is now almost totally blind and his DIY days are pretty much done. I send Jim a portion of the proceeds for every one of these filters I make so, here's an opportunity to give something back to someone who has been a big help to the DIY community. Does it have VC resonance? A: No. But it can be accomplished by replacing the resonance pot with a VCA. Are all 3 modes (LP,BP,HP) available simultaneously? Does it have 1V/Octave tracking? A: Yes, for about 4 octaves then, it starts to go flat. There is a 10K MT trim pot on the board for tweaking the response. There is a seperate input for modulation with a built-in mod-input attenuator connector. When you order, let me know what your MW username is so I can match up orders with usernames. Tnx. Two days to go on the VC Filter sale. I guess it's time to start asking what would be the next item? The filter sale will end at midnight tonight. So far, suggestions for the next "sale" are for the Amplitude follower. I'm thinking of adding a second mod input. Is it safe to assume that there's a simple summing point I can add that to? Right behind pin 5 of CN2 (center pin of the CF2B block) is a 100K resistor R10 and behind Pin pin 8 of CN2 (center pin of the CF2C block) is a 100K resistor R12. Both resistors are connected to the associated pins on the side closest to the pins. The other sides are connected together and connect to pin 9 of U1, which is a TL074 right next to the resistors. That's the summing point. So rack up all of the inputs you desire through 100K resistors and tack it onto the far side of resistor R10 or R12. That would be easier than tacking it on to pin 9 of the TL074. I figured it would be something like that. Thanks for the detail. USPS tracking says my filter arrived at the neighborhood post office this morning. 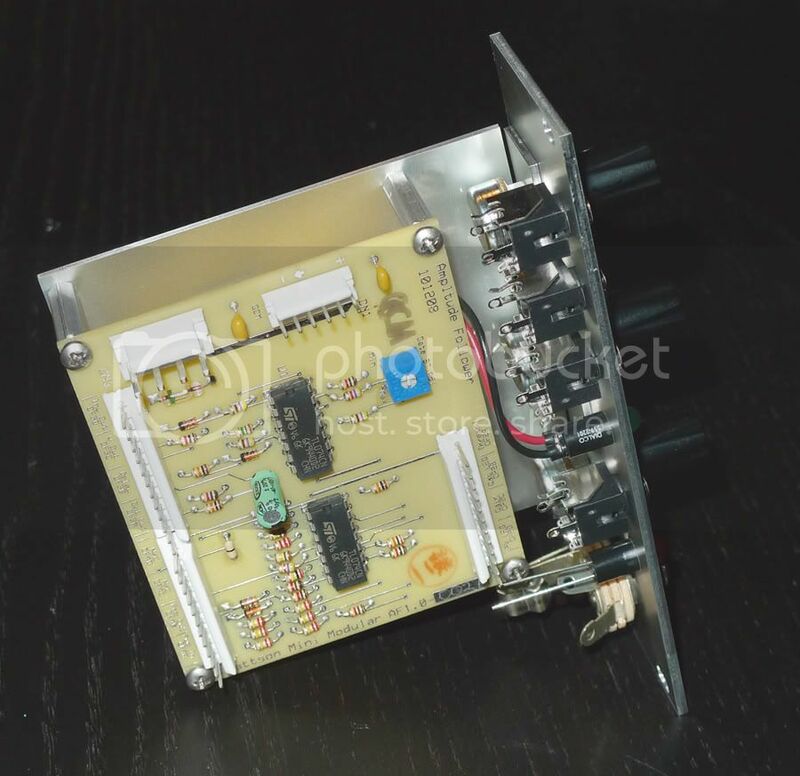 Would it be possible to wire up and mount this VCF board behind a 4hp or 5hp eurorack panel? I saw a picture of one behind a 6hp panel, and 4ms and intellijel are able to mount 2 jacks side by side on a 4hp, so I am thinking it should be possible. Are they using a special compact jack to make it fit? The tricky bit seems to be how/where to attach the board to the panel. The board would fit if you didn't use the 4-pin header and soldered the power wires directly to the pads. How to mount it and get the panel components mounted in harmony would be a good exercise in creativity. Flight, of FoH has some skinny jacks. I'm sure he'd be willing to sell a few. or, I could get them from him and toss them in the box to save on shipping. If depth isn't too big an issue, maybe adding a couple hex standoffs to get the board past the panel components then, add two right angle brackets to those. Are they using a special compact jack to make it fit? The tricky bit seems to be how/where to attach the board to the panel. Intellijel and other companies are using jacks mounted directly on the PCB, so they do take up a lot less space. Piecing things together on your own usually takes more space. Maybe the FoH jacks that Mattson recommended might work. 6hp probably, I don't know about 4hp for this module. I made my Amplitude Follower 8hp and the panel I was working on for the JP-VCF was also 8hp. I just like having more space, especially on a filter because I will be tweaking those knobs a lot and I want to be able to get my big fat fingers in there. 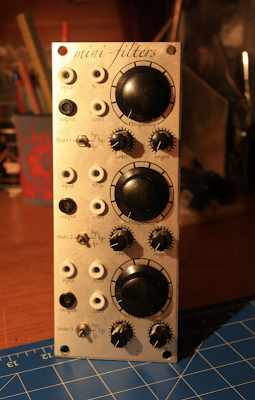 Here are some pics of my in-progress JP-VCF panel and my soon-to-be-soldered Amplitude Follower. I used a second piece of metal bent at a 90-degree angle to mount the board. It's already pretty deep by Euro standards. The bent panel attaches using the three potentiometer mounting holes. Second, the usual 'skinny jacks' which will fit 2-per-4hp are the Kobiconn 16PJ138. (I think Flight has the 16PJ135, which have a little spring in the contact mechanism but utilize the same housing.) You can basically get away with 10mm-on-center spacing with these, meaning they fit edge to edge, but they fit. Mouser sells them at like $.29/ea in quantities of 10+. 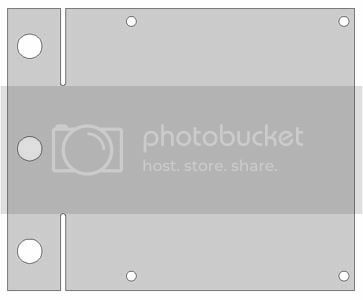 Another thing I've found is that going up to a 6hp panel doesn't really help if you have too many pots to mount in the one column. It lets you get more jacks in and gives you some extra finger-room, but you really need to allow 4hp per column of pots. If you have to go to a 2nd row, it's gonna be an 8hp panel. You could physically squeeze 2 12mm pots side-by into 6hp, but I wish you luck turning the knobs... I can't, and I've probably got the longest, skinniest, most 'Euro-friendly' fingers you've ever seen. The best knobs I've found for really dense Euro panels are the ~12mm skinny ones: Serge-style Davies clones, the Neutrik/REAN P400S series (a-la Maths/QMMG) or the Eagle soft-touch knobs that TipTop uses - #450-4010 @ Mouser. Oh, and if your case is deep enough to handle it, ask George to use a right-angle power socket on the board. It'll add an inch of depth but it keeps the profile narrow - and it beats hardwiring the power cable. Wow, that got rather long-winded, didn't it? Well, long story short... there's not much wiggle-room if you decided to do it, but a 4hp version of that filter seems physically possible to me. Tight, but possible. The mounting panel cost me $20. WAY too much, but since this was just a one-off for my own use it was worth the cost, saving me a few headaches. It's 1.5mm thick. Too thick really, but as far as I could tell that was the thinnest I could order from FPE.